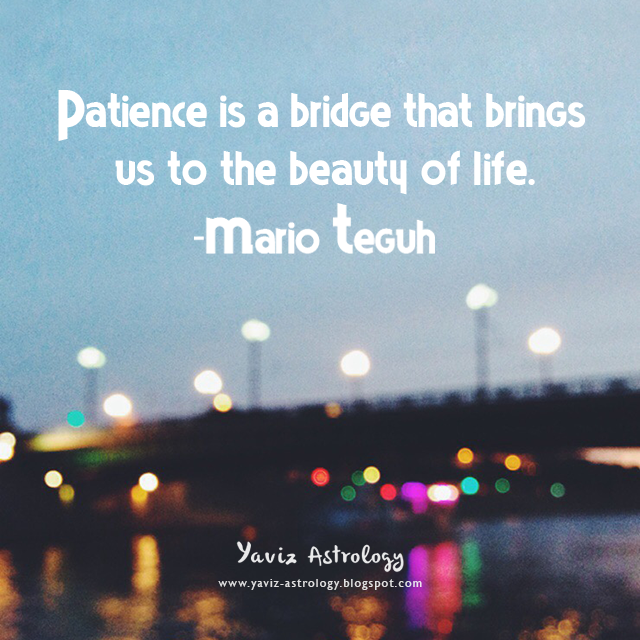 Patience is a bridge that brings us to the beauty of life. There are times in life when it's easy to have patience, and times when it's not so easy. What then, can we do in times when impatience might be taking over? That will be a good time to interact with our ego, and to ask ourself: Am I trying to please the ego? Or am I just trying to control or rush things? Am I trying to fight for peace? Or am I just trying to hurt another? Whatever the case may be, be more gentle with our ego in those moments, and see how it transforms our emotions. Find your own sanctuary this weekend — in spite of possible obligations and responsibilities, and things will go swimmingly. Note to self: A calm ego is the root of peace. Go at your own pace. 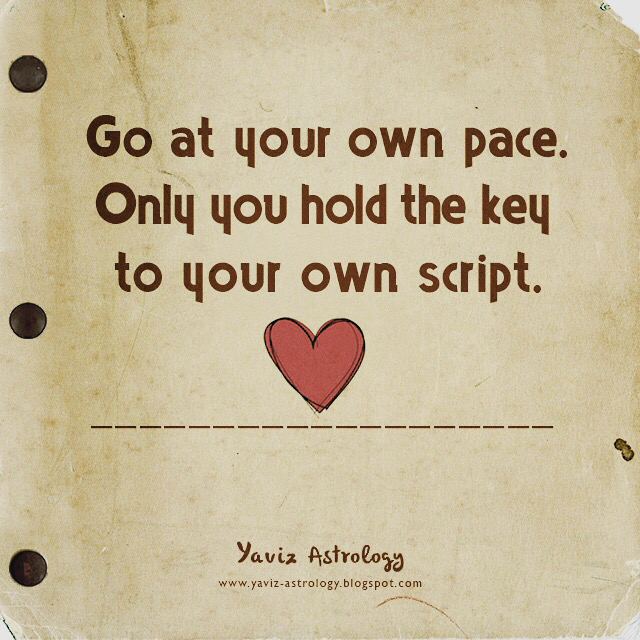 Only you hold the key to your own script. People may have different feelings about you, different thoughts about you, or different ideas about you. But only you've walked in your own shoes. Only you know what your heart has been through. And only you know the true story of your life. Trust it. Own it. And keep going at your own pace - with the knowledge you have, and the wisdom you've acquired along the way. Slowly but surely, the rest will catch up to your light. Jupiter in Leo has been expanding our personal vision for our life. Inspiring us to have bigger trust in our own path. To take bigger steps in tackling our problems head on. And to keep going confidently in the direction of our dreams. This is the time to be quick on our feet and quick with our thinking. So take this opportunity to analyze our future plans. We might find something that could be improved. Place more light on any shadows that cause a mystery in our life. And do whatever it takes to keep exploring, and to keep the faith strong. We are more open to what life is all about, and the following weeks should hold in a barrel full of surprises. The love in the air also sizzles with energy. Love can be surprising, love can be calm or it can be playful and adventurous. We have the chance soon to choose which we would prefer. As we pursue our dreams with vigor, the more masterful we become and the more our confidence shows in all that we do. We want to enrich our life with knowledge and enjoyment. Keep going. There is no other way now but forward. Note to self: What I am, has nothing to do with what other people think of me. I know my heart and mind will lead me to the highest vision I have for myself as I move forward with confidence, conviction, and trust. Happy Full Moon! The Moon in Virgo is opposite the Sun in Pisces, marking a Full Moon in the sign of the Virgin. This brings a new culmination of all that we have been working toward since the New Moon in Aquarius back on February 17th. 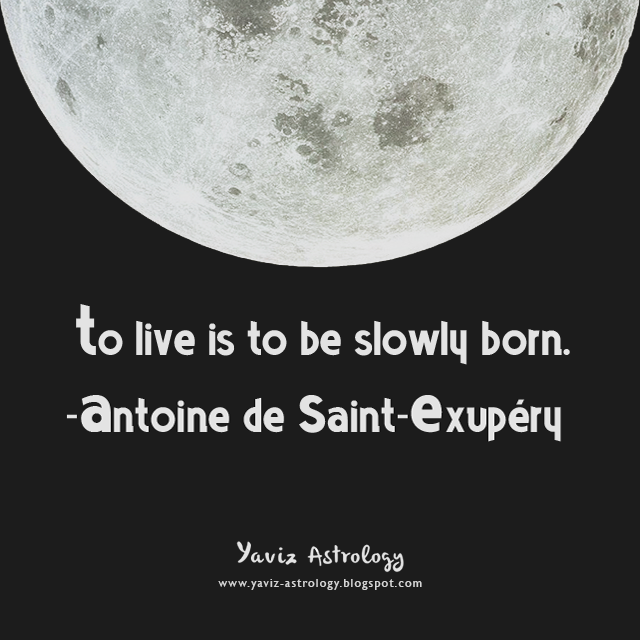 The Full Moon in Virgo is ripe for growth. We can look back and see how much we have grown in the past couple of weeks, and how much we have learnt. Although on a soul level, there is no end to growing and learning. We are forever growing into our truest and most authentic self, and always finding ways to evolve beyond our past limitations. This Full Moon in particular is also ripe with opportunities for healing, guiding us to start seeing where we can be reborn and start anew. With Venus and Uranus conjoining and trining Jupiter Rx, we could have a lot of new possibilities coming our way — just make sure that we don't talk ourself out of something good. Our playful mood and courage will be strong to create great moments of inspiration with people. We are in our element, so go for that challenge. Research will be fun as everything is made easier, thanks to the Moon's trine to Pluto. Intense intuition and understanding of our feelings and those of others give us the ability to lead a conversation in a new direction. We will be stronger - physically and mentally, and can accomplish much by giving it our all. Trust our sixth sense, it will never let us down. Breathe in new hope. Breathe out unease. It's time for dreams to be lived!